Hello fellow crafters. Thanks for popping by my site. 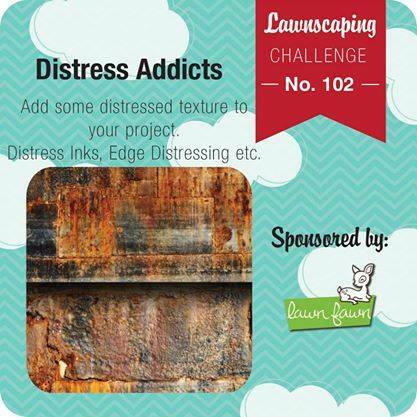 Today, I'm sharing with you a card I made for a new lawnscaping challenge. The theme is Distress Addicts. I'm pretty sure that most of you have hear of the word "distress" being associated with Distress Inks. Now, time to get those inks out because here's a chance to use them! For my card, I've used the Milo's ABCs stamp set to create a simple alphabet background and heat embossed it in white. I took my distress inks to make a nice cheerful background to match the adorable monster. I hope you liked it and join in the challenge to stand a chance to win a prize sponsored Lawn Fawn. This is so awesome!! I LOVE the background! It's so stunning! The white embossing and distress ink background with the cute as can be monster is SO cute! !